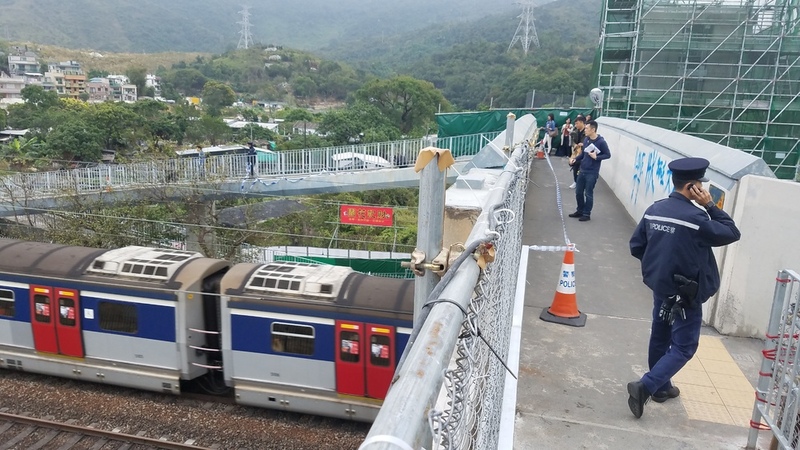 A city-wide search has been launched for at least one person whom police believe threw a 17-meter metal railing onto an MTR electric cable near Tai Wo Station, disrupting East Rail services yesterday morning. The railing was ripped from the stairway of a pedestrian footbridge before being flung onto the cable from the footbridge. The handrail was found on the tracks after it damaged the power cable. The power supply was cut at about 5am. Trains between Tai Po Market and Fan Ling were disrupted for about an hour. The first train from Lo Wu was delayed for two minutes. The trains operated at reduced intervals between some other stations along the line. Services between Tai Po Market and Hung Hom were reduced to every 10 minutes, and trains were running every 10 to 15 minutes between Tai Po Market and Lo Wu or Lok Ma Chau Station. MTR Corp deployed shuttle buses for passengers. It said staff removed the handrail and repaired the cable around 6.15 am. The case was classified as criminal damage. The piece of handrail was ripped from a pedestrian bridge on Tai Wo Service Road East, near Kau Lung Hang. The incident was not captured by a security camera on the footbridge. A source said the camera was not plugged to a power point. Villagers nearby said usually there were bikers on the footbridge and that burglaries happened frequently in the area. A villager said the cable was too close to the footbridge. Another resident, surnamed Wong, said young people gathered nearby and were raucous at night so she was scared when passing the area. Barrister Albert Luk Wai-hung said the act was extremely serious and selfish. He said the vandal is looking at up to 10 years. He said it appeared to be premeditated as the handrail was torn from the bridge and then used to damage the overhead cable. He said some acts of vandalism like kicking a garbage bin or damage a wall because people were in bad mood might get a light penalty, but this case was different. "The handrail can't removed with bare hands. Tools were used," Luk said. DAB lawmaker Ben Chan Han-pan, who chairs the transport panel, said physical barriers should be installed around footbridges over rail lines.